These map updates will roll out over the next 24 hours across all our Maps APIs and related services. As with previous updates we do ask that you refresh any data that you have previously obtained for these countries using Maps API Web Services, and cached for use in your Maps API application. If you have any questions or concerns relating to this, please post them to the Google Maps API forums. With over 600,000 sites actively using the Google Maps API, more people around the world view maps provided by the Maps API than any other source. For this reason it’s vitally important that Google Maps provides the most accurate and up to date map data possible. For this reason we're happy to introduce updated maps and the "Report a Problem" tool to France, Luxembourg, and Monaco. As with previous updates in countries such as the U.S.A., Australia, and parts of Europe, this update utilizes a wide range of authoritative sources such as the Institut Geographique National. In addition, the "Report a Problem" tool on Google Maps allows you to let us know if some aspect of the map that needs correcting, and we'll do our best to address it quickly (often within just a few days). Rome 2 Rio is one of the most exciting new Google Maps API applications. 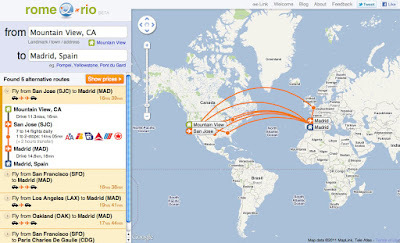 Start by entering any two end points in the search fields and Rome 2 Rio will give you a list route options that include flights, trains, ferry, and driving directions. When you select a given route, the site allows you to view the details of each leg plotted out on the map and also gives you pricing options for flights. To learn more watch this video from Rome 2 Rio. The U.K. Foreign & Commonwealth Office regularly issues travel advice for British citizens on the safest places to travel. Before you plan your next vacation, it might be worthwhile checking this map published by the Guardian that uses Google Fusion Tables to map out advice from the FCO. This map provides a fascinating snapshot of world travel. Plnnr is a one stop shop for travel planning advice. You start Plnnr by selecting a destination and length of stay. Then you select a theme (with kids, outdoors, popular, or culture experience), your level of intensity (more leisurely travel or ‘see everything’ travel), and your desired level of luxury. 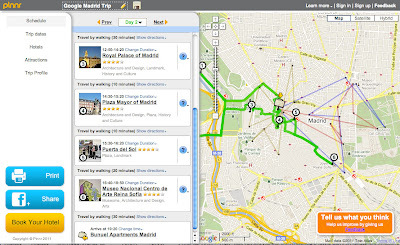 Based on these values, Plnnr builds a top to bottom trip itinerary complete with route maps, hotels, and attractions. You can print these plans out or share them with friends online. It’s a great tool to help you get a lay of the land before you even visit a new city. 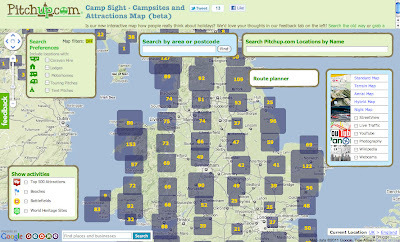 Pitchup.com is a new project to help U.K. campers find campsites or attractions and share reviews. The site has a wide range of tools to help your zero in on what you’re looking for. There are search tools for camping options (lodges, tents, trailers, etc. ), layers of nearby photos and videos from Panoramio and YouTube, detailed information about each campsite, and much much more. Ask anyone who’s spent significant time traveling and they’ll tell you one of the biggest difficulties on the road is finding a good public restroom. 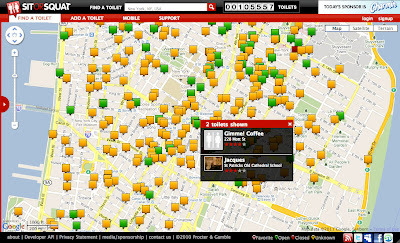 While you’re out and about, Sit or Squat makes this task easier by providing a list of over 105,000 open toilets from around the world. There are even pictures, descriptions, and ratings to help your decide where’s the best place to go! If you’re looking for some help to plan your next vacation, luckily there are some new sites to help you decide where to go, how to get there, and what to do once you’re there. Gone are the days of tedious library research, transportation schedule matching, and needlessly getting lost. These applications can do it all for you. What is the Distance Matrix? Thanks to the new Distance Matrix service, which we are launching today, I can now relive these moments from my youth. The Distance Matrix service is a simple and efficient way to obtain the travel distance and time between many locations when you do not need the full route details for any individual pair. The below applications generates a distance matrix for walking from major London railway stations to several London landmarks. Roll your mouse over the matrix cells, or tap a cell, to see the relevant route. The Distance Matrix service is also useful for sorting or filtering search results. For example, let’s say your Maps API application enables users to find nearby grocery stores and you want to present the results sorted by drive time. The locations are stored in a spatial database such as Google Fusion Tables, which can return all stores within a given straight line distance. Using the Distance Matrix service you only need one more query to obtain the drive time from the user's location to each of those stores in order to sort them accordingly. When I was young, I often found myself on long car journeys with nothing to occupy me but a dog-eared UK road atlas. On the back page, there was a chart that showed the driving distance and journey time between pairs of major cities, and I would amuse myself figuring out which pair was furthest apart, and how long it takes to drive the length and breadth of the country.